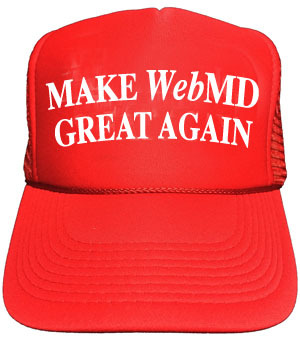 Pharma Marketing Blog: How to Make WebMD Great Again! How to Make WebMD Great Again! World of DTC Marketing blog author and pharma marketing consultant Richard Meyer has some advice for WebMD, which may be looking for a buyer (read “’Same Amount of Eggs, More Baskets’ – Lesson Learned by WebMD re Pharma Digital Spending”). One: Draw a clear line between ads and integrated content on WebMD and ROI and present to both pharma clients and agencies. There’s a drain of digital marketing talent within pharma and this is a great time for WebMD to throw DTC marketers a life preserver by both making them look good and smart. I don’t get how this makes DTC marketers look smart let alone “good.” The consensus is that banner ad ROI on WebMD is not so good (op cit), so advertising on WebMD is not the "smart" thing to do. Perhaps Meyer is suggesting that pharma marketers stick to "integrated content" (read, for example, "Pharma Lags in Utilizing 'Content Marketing' to Fill Online Health Info Void"). Some believe that WebMD is actually too cozy with pharma, which adversely affects its “trustworthiness.” In 2010, for example, Sen. Chuck Grassley sent a letter to the site after finding that a WebMD quiz for depression, sponsored by pharmaceutical company Eli Lilly (a good example of “integrated content”), was rigged to suggest everybody who took the test was at risk for major depression. Naturally, that would make them a potential candidate for antidepressants, conveniently manufactured by Eli Lilly. Two: Attend and present case studies at EVERY pharma conference. Ha! Ha! This is a surprise coming from Meyer who once said “Pharma conferences are not meant to improve marketing, rather they are a forum for marketers to share their marginal accomplishments” (here). So, I’m not sure how WebMD sharing its “marginal accomplishments” at industry conferences can help it. Rich has 6 other suggestions, which you can find (here).